The original version of this article, by Cynthia Brady, appeared in the June/July 2011 edition of USAID’s Frontlines. In 2007, many in the advocacy community rushed to categorize the conflict in the Darfur region of Sudan as a “climate war” in the wake of a compelling United Nations report that emphasized the ways climate change and environmental degradation can drive conflict. In both cases, subsequent research and analyses conducted by prominent scholars countered those original claims of such direct climate and conflict connections, at least based on existing evidence. Those studies are two examples of the recent spate of analyses on the subject and serve as cautionary tales against alarmism and overly simplistic assumptions about specific connections between climate change and stability. The science and practice of analyzing the interaction of climate change risk and conflict risk is new and still evolving. As a result, there is little certainty over exactly how climatic change will manifest in specific locations and what the consequences will be for economic development, political stability, and peace and security. Around the world, climate change likely will create both risks and opportunities, making it critical that development and relief organizations like USAID consider climate change not as a monolithic threat but rather as an important influence within a complex web of environmental and social factors. Responding to climate change effectively means taking action to reduce the threats. It also means harnessing opportunities by helping people and institutions to effectively cope with and adapt to change – environmental or otherwise. Climate-focused interventions, if conducted strategically and with sensitivity to local context, can produce outcomes for conflict prevention and sustainable development as well. For example, recent USAID-funded research in the conflict-prone Karamoja region of northeastern Uganda found that engaging local communities in the design and implementation of climate change adaptation activities – for example, promoting shared grazing areas and creating small-scale irrigation systems – holds considerable potential to reduce conflict by building social cohesion and addressing feelings of marginalization and disempowerment among local community members. Since 2008, USAID has invested in research to better understand how specific climate factors contribute to the risk of conflict and affect the resilience of social structures and institutions. The goal is to build a deeper understanding that will enable the agency and its partners to respond most effectively to climate-related stress, reduce the risk of violent outcomes, and maximize the potential for U.S. foreign assistance to prevent conflict and promote stability. This knowledge also will help USAID make wise investments as part of meeting U.S. Government commitments under the Global Climate Change Initiative as described in President Barack Obama’s September 2010 Presidential Policy Directive on Global Development. The research thus far points to climate change as an exacerbating factor in situations where political, economic, and social stresses already exist. The risk of conflict is greatest where there is poor governance and low institutional capacity. The agency, through its Office of Conflict Management and Mitigation (CMM), has identified two basic scenarios under which climate change could combine with other variables and potentially lead to conflict. First, climate change could intensify existing environmental or resource problems. For example, a series of droughts could reduce the available local water supply, aggravating competition between farmers and pastoralists in already arid regions. Second, climate change could create new environmental or resource problems that contribute to instability. Changing rainfall patterns, for instance, could damage agricultural production in formerly fertile areas, decimating local livelihoods and causing food insecurity. There is a third area of potential risk for USAID and other donors as well: namely, that climate-related financing, policies, and programs which have not adequately considered local conflict dynamics and context could produce serious unintended negative consequences. Climate change-related interventions such as incentive payments to stop deforestation – particularly in fragile states and conflict-affected areas – must recognize that both the money and the power to allocate benefits may inadvertently reinforce the social status quo, shift local power balances, or expose governance failures. In her field work in Nepal, Janani Vivekananda, a researcher with USAID partner International Alert, recently illustrated how certain types of assistance might inadvertently do harm. She explained how a now-defunct village water tap installed in an effort to mitigate the effects of climate variability, did not appropriately consider the local social, political, and conflict context or even basic environmental parameters. In the end, it contributed to local grievance. The community had requested the tap to be installed during a period of water stress and three consecutive years of drought. The Government of Nepal sponsored the project just before the elections. This story highlights the reality that local context will define the outcome of peace or conflict and, thus, as CMM’s discussion paper “Climate Change, Adaptation, and Conflict: A Preliminary Review of the Issues” noted, there remains a pressing need for a more robust, fine-grained understanding of the interaction between climate change and the political, social, and economic realities of conflict-prone areas. To help fill this information gap, USAID is supporting field-based climate change and conflict research in Peru, Uganda, Ethiopia, and the Niger River Basin in West Africa. At the global level, the agency is improving its ability to integrate climate change considerations into conflict early warning models. It is also establishing academic and practitioner partnerships that explore a wide range of environment and security issues. With conflict-sensitive development assistance and with smart climate change policies and programs, vulnerable countries will have enhanced opportunities to build stronger societies and more resilient institutions for sustainable development, peace, and security. Cynthia Brady is a senior conflict advisor in USAID’s Office of Conflict Management and Mitigation. 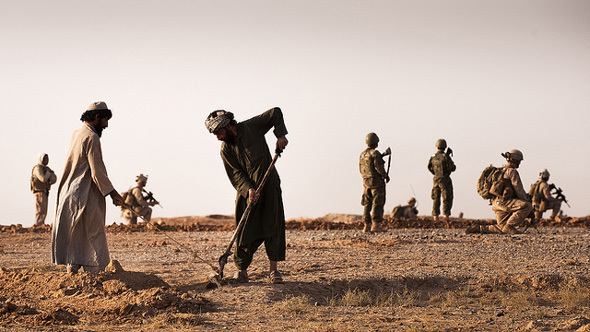 Photo Credit: Afghan farmers plow a field guarded by U.S. Marines, courtesy of flickr user isafmedia. Cynthia & colleagues are focusing on the right issues at CMM vis a vis climate and security links. Very useful the work to develop principles for conflict-sensitive climate efforts. The article title, inherited from the Frontlines piece, is another example of how the dramatic rather than the accurate still holds strong appeal to the headline writers.